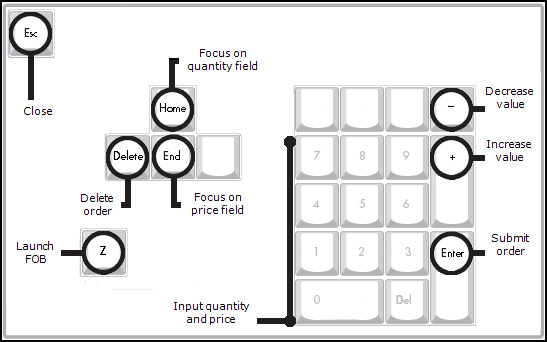 You can use the keyboard to interact easily with the Floating Order Book. Use the default hotkeys or customize them to create your own. Launch the Floating Order Book. Decrease the price or quantity fields. Increase the price or quantity fields. Submit the order as defined and close the Floating Order Book. In the Component column, click Floating Order Book. Note: The keyboard shortcut to launch the Floating Order Book only works in the Market Grid. In the Market Grid, click the BidQty or AskQty for the product for which you have working orders. Note: You can change the launch key using the Hotkeys tab on the Properties menu.